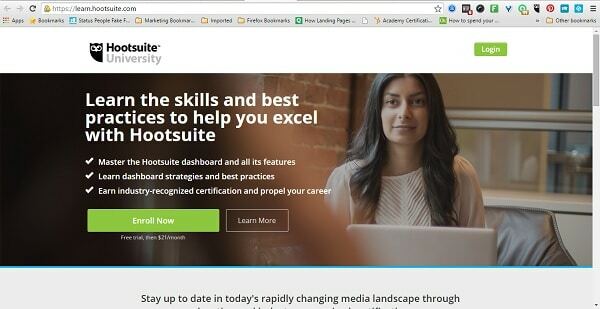 Hootsuite University is the learning program of the popular Hootsuite social media management app. I earned a Hootsuite Certification from these learning program as a certified social media manager. When I started using Hootsuite to manage my brands and clients social media, I encountered the learning program of Hootsuite which is the Hootsuite University. I then grab the opportunity to invest and enroll for only $21 per month in addition to your Hootsuite app subscription. Hootsuite University taught me so much more about social media which I didn’t learn from just learning by experience. I learn about the best practices in the industry, case studies from very successful social media marketing campaigns and a lot more. To better learn more about social media marketing and leveraging it using the Hootsuite app, I suggest you enroll in the Hootsuite University for a very affordable way to learn more.